Can't resist fresh doughnuts? If you give in too often, they can bulk up your belly. Better Bet: Stop at one. A glazed doughnut has 260 calories. The whole box packs 3,120 calories. A 200-pound man would have to run about 25 miles to work that off. 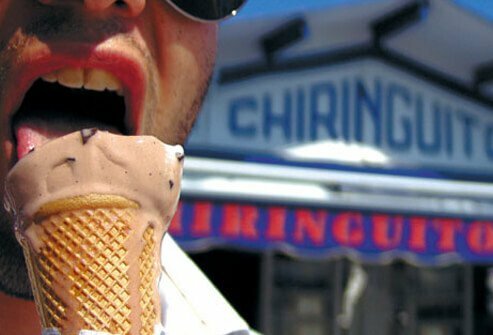 You do get some calcium from ice cream. But you also get 230 calories per half-cup, and that's just for plain vanilla, no toppings. Better Bet: Look for the slow-churned kind. It's lower in fat, and many flavors have only 100 calories per half-cup. 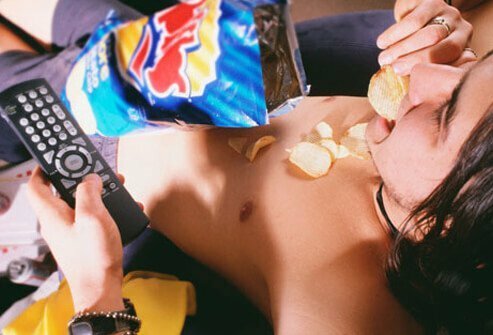 A serving of 15 chips has 160 calories. But who stops at 15? Add just 2 tablespoons of French onion dip and you've piled on 60 more calories and 5 grams of fat. Better Bet: Fat-free popcorn. Six cups have just 100 calories. This cocktail is as fatty as it is trendy. It's Scotch or vodka infused with bacon fat. Sometimes it's served with a strip of bacon. At around 284 calories a glass, that's more than in a doughnut. Better Bet: Classic martini, in moderation. The alcohol still adds calories, but your heart will prefer the olive to a strip of bacon. The average 12-ounce can of beer has about 150 calories. Those calories add up, just like anything else you eat or drink. Better Bet: Light beer cuts your intake to about 100 calories a can. 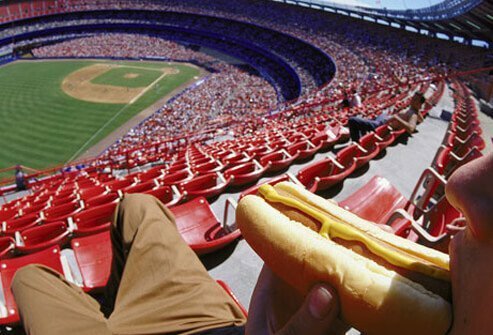 What's more all-American than cheering for your home team while noshing on a hot dog? Add extras, and the calories rise. One cheese dog has 390 calories and 8 grams of "bad" fat. Better Bet: Peanuts. This classic ballpark snack is high in protein, fiber, and good fats. If you're the meat and potatoes type, you'd love a big, juicy steak that covers your plate. But a 16-ounce prime rib can have more than 1,000 calories and 37 grams of "bad" fat. That's without any sides or appetizers. 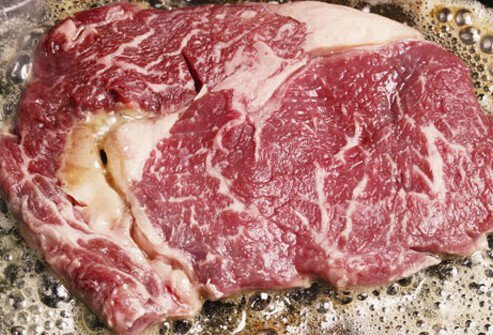 Better Bet: Lean meat, such as sirloin, tenderloin, or flank steak. The piece should be the size of your fist, not your plate. Pizza can be healthy. 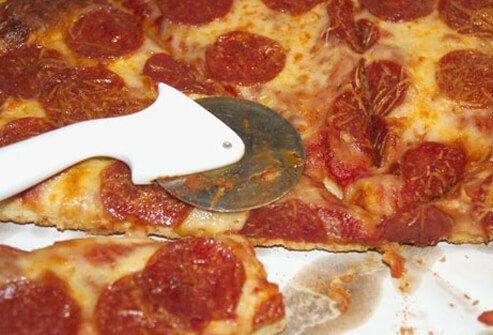 But if you like toppings such as pepperoni, sausage, ham, and beef, you could get more than 300 calories in one slice. Better Bet: Instead, top pizza with veggies. You get extra fiber and nutrients, and up to 100 fewer calories per slice. If it looks big and loaded, it will bloat your calorie budget, too. 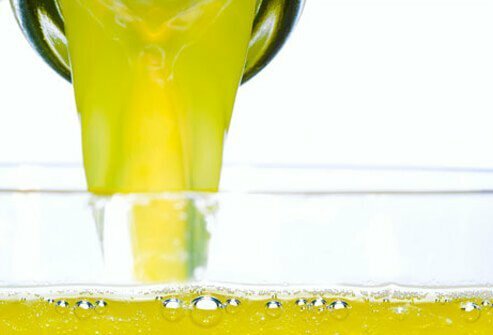 Some have more than 1,000 calories and up to 75 grams of fat. Better Bet: Stick to a single grilled burger made with lean ground beef or lean turkey, or a veggie burger. Want some fries with that? 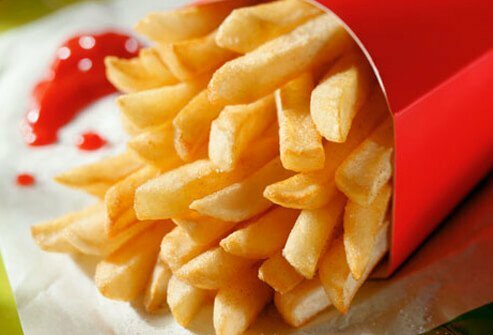 Most of us do, not knowing that a large order of fries can have as many calories as a burger. Better Bet: Order a side salad or fruit cup. Do you know how many calories are in a serving? Or how many servings are in a bottle? One 20-ounce bottle of regular soda packs 250 calories. Better Bet: Water. If you're seeking caffeine, try black coffee. A 20-ounce cup has almost no calories. Like milk? Make it nonfat to stay under 100 calories. 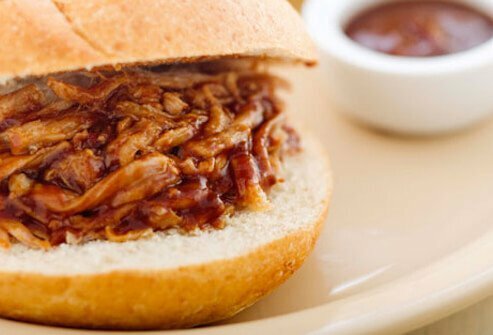 Tailgate party staples include beer, chips, and barbecue pork sandwiches on fluffy white rolls. The shredded pork may hit the spot before you settle in for the game. Yet each sandwich can have more than 600 calories, depending on the size. Better Bet: Lean grilled chicken or burgers on whole wheat buns. Pair with healthier tailgate sides like baked beans and coleslaw. 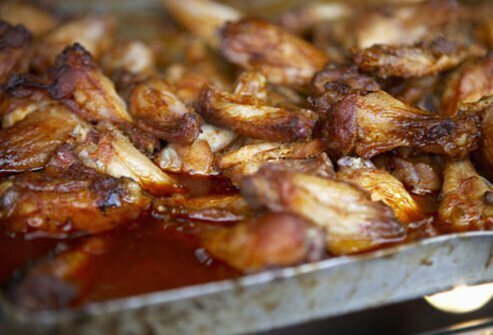 An order of chicken wings packs about 700 calories. If you choose the boneless buffalo-style, that's 1,160 calories, not counting dips! Blue cheese sauce adds another 240 calories and 26 grams of fat. Better Bet: Grilled chicken strips. Make wings a rare treat. 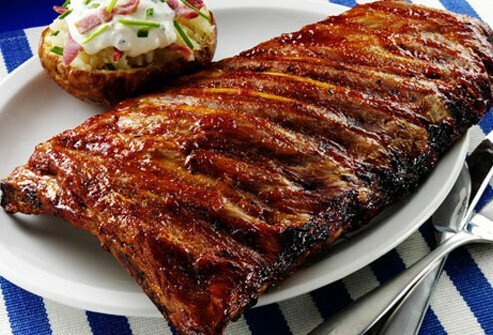 A whole rack of ribs has 1,000 calories and a day's worth of fat. The tasty sauce adds calories, sugar, and sodium. Better Bet: Have half a rack of ribs, and save it for a special occasion. Add a baked sweet potato with a squeeze of lime juice or sprinkle of cinnamon to round out the meal. 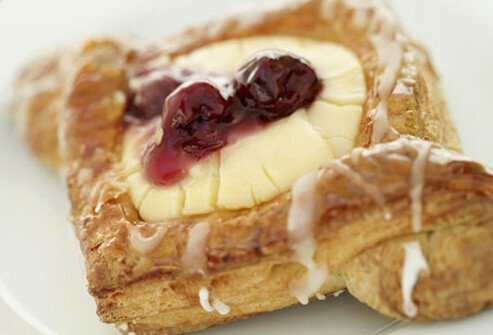 One Danish pastry has about 440 calories and plenty of fat. Better Bet: Fresh whole fruit and low-fat yogurt. Or whole wheat toast, topped with real-fruit spread, no butter. There's nothing wrong with convenience, but watch the size. Some dishes are very high in calories, sodium, and trans fats. Better Bet: Read labels for lean frozen dinners made with whole grains. If you can't resist piling your plate, try to make smart choices. Load up on steamed vegetables and salad. Skip the fatty dressings and sauces. 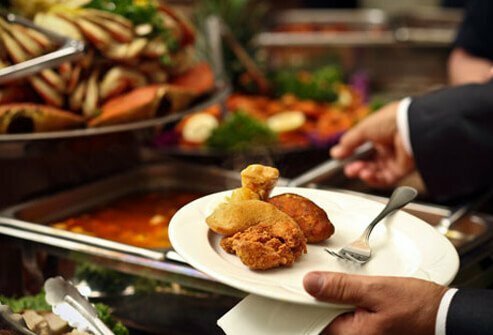 Better Bet: Steer clear of buffets if you have trouble setting limits. Not everything tasty pads your belly. 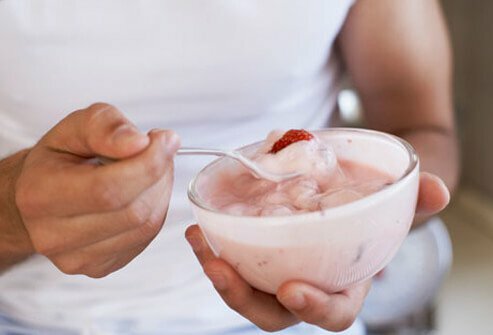 In one study, yogurt (along with veggies, whole grains, fruits, and nuts) was among the foods not linked to weight gain. Another study linked eating dairy foods like yogurt to lower body fat and belly fat. Bonus: Low-fat or nonfat yogurt boosts calcium. Look for those fortified with vitamin D. Most adults don't get enough of either of these nutrients. There is no magic food that burns fat. But eating more of any fruit, in place of fattier or high-calorie fare, can help you lose weight. 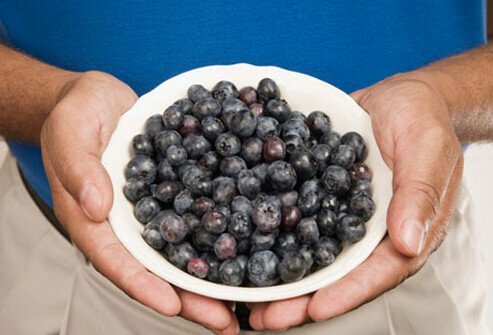 Blueberries, and other fruits, are rich in nutrients that are good for you and are naturally sweet. They may be your best friend against belly fat. One study found that people who eat more soluble fiber gain less belly fat than others over 5 years. Just 10 grams a day of soluble fiber made the difference. That's the amount in two small apples, a cup of green peas, and 1/2 cup of pinto beans. Regular exercise can help you lose weight. Though you can't do exercises to spot-reduce, being more active will help your whole body, including your belly. If you're already overweight, shedding just 10% of your weight will improve your odds of staying healthy. Ben and Jerry’s Ice Cream: "Our Flavors – Vanilla." Burger King: "Menu and Nutrition." Calorie King: "Ales and Beers." CalorieLab: "Cheesecake Factory Nutrition Facts." Coutinho, T. Journal of the American College of Cardiology, 2010. Edy’s Slow Churned: "Flavor Details – Vanilla." Experimental Biology 2009, New Orleans, April 18-22, 2009. Hairston, K. Obesity, published online June 16, 2011. 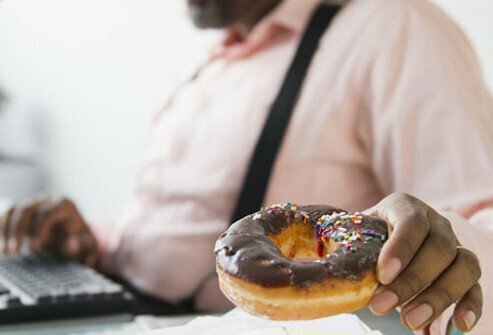 Johns Hopkins: "Johns Hopkins Health Alerts: More Evidence Against Trans Fats." Lay’s: "Classic Potato Chips," "French Onion Dip." 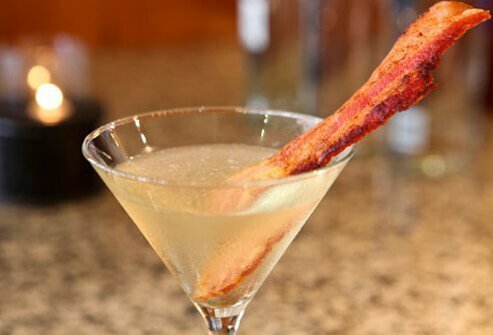 Los Angeles Times: "Candied Bacon Martini." 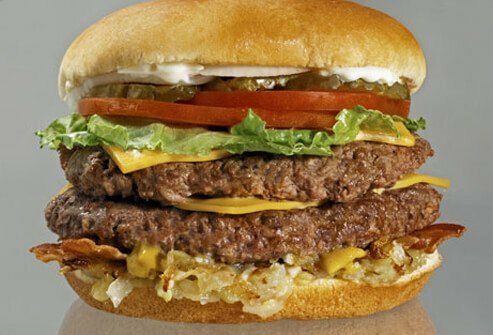 McDonald’s: "Angus Bacon & Cheese." 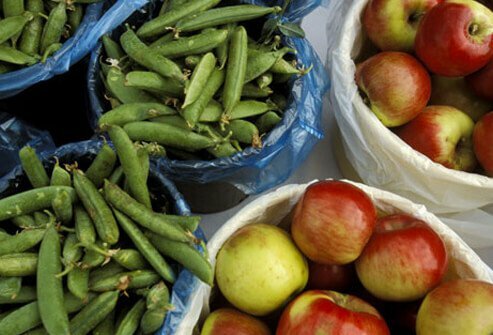 National Diabetes Education Program: "Buffet Table Tips for People with Diabetes." NPR: "Would You Like A Little Bacon In That Martini?" Panera Bread: "Nutrition Calculator – Cherry Pastry." Pepsi: "Pepsi Product Information – Mountain Dew." Ruby Tuesday: "Nutritional Menu Guide." Runner’s World: "How Many Calories Are You Really Burning?" Self Nutrition Data: "Peanuts, all types, oil-roasted, with salt." Self Nutrition Data: "Spiced Up Sweet Potato Fries." Stancliffe, R. American Journal of Clinical Nutrition, published online June 29, 2011. Swanson: "Dinners – Chicken Nuggets." Weight-control Information Network: "Weight and Waist Measurement." Wendy’s: "Nutrition Facts & Personalize It."